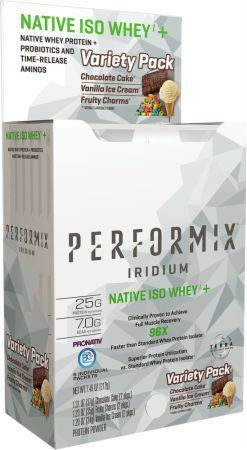 Mix or blend 1 scoop of Performix™ NATIVE ISO WHEY+ with 8 ounces of cold water, juice or milk. For best results, take Performix™ NATIVE ISO WHEY+ within 30 minutes after working out. Pronativ is the purest whey protein available due to its unique, clean and low temperature extraction process. Proteins are extracted from top quality hormone-free milk to preserve it’s properties without collecting the typical cheese residues, GMP, added ingredients and chemical agents found in the standard Whey Protein Isolate. Unique TERRA Intelligent Dosing technology offers controlled release of key metabolic ingredients. This targeted nutrient delivery system is designed to impact absorption and drive unparalleled results. free form amino acids are released over an extended period of time with our patented technology. Mental toughness and clarity of mind are the difference between achieving your goals and redefining them. PERFORMIX IRIDIUM is designed exclusively for elite athletes seeking to sharpen their edge and catalyze physical intelligence.